The Vietnam war occurred in Vietnam. Laos and Cambodia during 1959 and 30 april1975. the war started when communist north Vietnam tried to take over the republic of south Vietnam. 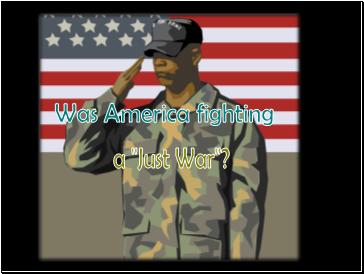 It was the longest war America ad ever fought in and it lasted 15 years. North Vietnam wanted to take over South Vietnam. If they succeeded then it’ll be likely that Laos and Cambodia will turn Communist. 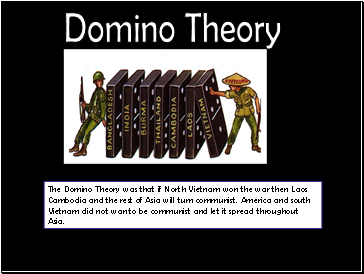 The Domino Theory was that if North Vietnam won the war then Laos Cambodia and the rest of Asia will turn communist. America and south Vietnam did not wan to be communist and let it spread throughout Asia. 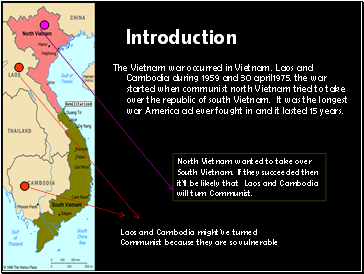 The Domino Theory was that if south Vietnam became communist then all the other Asian countries will become against. The Americans had more weapons, machine guns, rockets, launchers, tanks and helicopters. 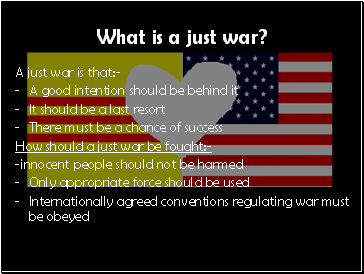 The war established peace and stability. William Kaylie was responsible for the killing of loads of civilians. He was imprisoned for life. What was happening to U.S during the war? Hippie movement started on December 31st .During the 1960’s 250 000 anti-war protestors gathered in Washington D.C. It was the largest protest to occur during the Vietnam war. 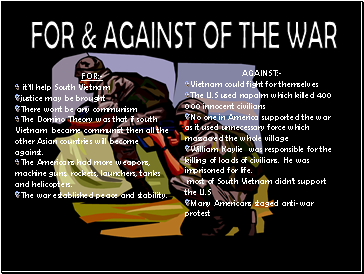 Many Americans where against the war in Vietnam mainly because 48 100 American soldiers died including 4 Students. They did not like the idea that America got involved in the Vietnam War. Thousands and Thousands of deaths occurred. Too many people died. Was there a chance of success? 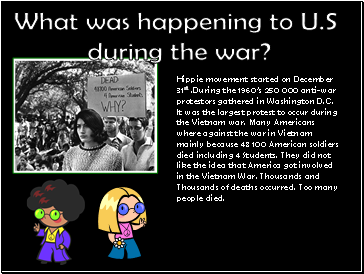 What are the effects of the Vietnam War?